I’m not so much a games collector as a games hoarder. The covers of my ancient rulebooks are tattered, pages have notes in the margins. Boxes of games that might be valuable in mint condition are held together with Sellotape. My games are meant to be played, and they’ve been lugged around with me from house to house, and shipped in a Chinese freighter from one continent to another. But a hoarder I am. I rarely let a game go once it enters my clutches. I can name the ones I’ve lost over the years – the original Warhammer box set, my 1977 classic Traveller box (replaced with the 1981 version), Wilf Backhaus’s Mage and Warrior, Advanced Melee and Wizard. The only game I can remember actually selling was FASA’s Star Trek. I loved that game, and wanted to play it so badly, but no one I knew at the time wanted to. I created characters alone in the evening. I designed starships with the Starship Construction Manual and sent them into battle with each other in the Star Trek III Combat Simulator. I designed traders a little more ethical than Harry Mudd and sent them on to earn their living in the Triangle. But it’s a lonely experience, pretending to be a bridge crew, and their enemy. Space is cold. Eventually I got rid of it. I’ve regretted that decision for years, and finally I’ve rectified it, with a copy of the deluxe edition rules from Wayne’s Books, and some of the supplements I once owned from Wayne, Noble Knight and the Dragon’s Trove. And I’m loving it. The deluxe box cover art is rather more dull than the basic set I had so long ago, but once again, after more than 25 years, I’m creating characters alone in the evening. My lonely character creation this time is not born of wishful ennui, but part of my efforts to re-familiarise myself with rules I haven’t seen since I was a teenager. The system is rather quirky. Character generation is a somewhat complex affair, with characters earning skill points in various professional or hobby skills at various points in their training and career. Skills are percentage based and, unlike in Traveller, in which you discover where you career takes you, you first decide what position you’ll hold on board the ship, and learn what happens to you character between joining Star Fleet and beginning the game. The game rules emphasise tactical combat rather heavily, with a particular focus on character movement. Combat resolution is extremely simple. 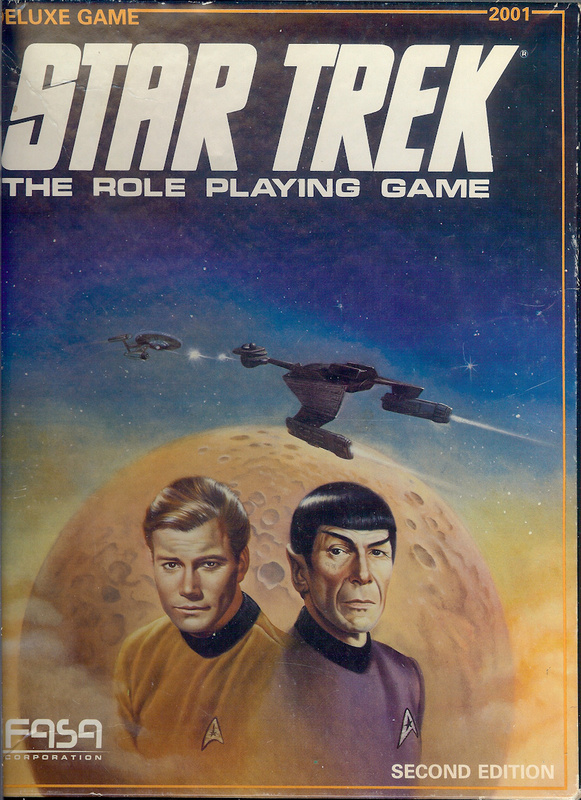 Some searching around second-hand game sites backed up the deluxe rule set with some of the classic supplements I used to own: The Triangle campaign setting, Merchant Princes, the Starship Construction Manual, and The Romulans sourcebook. I aldo managed to find the Enterprise and the Klingon D-7 15mm floorplans. All in all, it’s a hefty haul of nostalgic game material. But I think the time-consuming, complex character generation may mean I prepare pregens or templates for players to customise rather than run the full character development. This entry was posted in Gaming and tagged old school, Star Trek, tabletop. Bookmark the permalink.